With 15 years of research and development in energy medicine and biological processes, we at Mind Body Matrix have formulated a Unity Technology to harmonize the magnetic spin of electromagnetic fields. By harmonizing the magnetic field, it becomes coherent and compatible with organic biology. A massive reduction of 87-98% stress interference within the electrical system and nervous system is recorded via biofeedback muscle testing when using our EMF Shield for Electromagnetic Protection. Your body is electromagnetic, all communications within your body are initially conducted via electrical signals which in turn may trigger a chemical/hormone response. Additionally, your cells have a north and south magnetic polarity, when cells split and divide, a function that happens in your body millions of times every second, half of the nucleus will be attracted to each north/south pole and the cell will then divide at the centre. A disturbance to this polar attraction from external magnetic fields can have devastating effects on how your cells divide and in turn how your biological system functions. The energy/radiation being absorbed from your environment will have an impact on how your biological system functions and can directly influence your individual health and wellness. Studies directly link EMF Radiation to abnormal biological processes within your body resulting in dis-ease, dis-order and a range of ailments. EMF’s can directly affect internal cellular communication, heart rate rhythms, metabolic rates, hormone release, stress, impaired brain function, double-strand DNA breaks, and assist breaching of the blood-brain barrier. 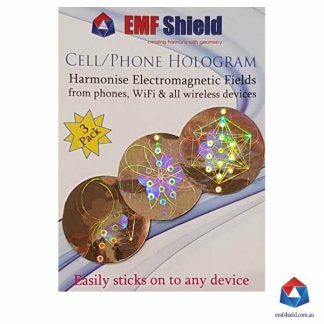 Our EMF Shield, it is not ‘shielding’ the field per say, it is offering a shielding to the potential harm EMF’s can cause by harmonizing the electromagnetic radiation into one which is coherent, therefore ‘shielding’ the body from harm. Our EMF Shield interacts with the quality of the field, not the quantity of the field so your wireless devices will not lose signal strength and will function correctly. To be in the flow and remain healthy you need to be connected to Nature and the Earths natural electromagnetic field, often referred to as the Schumann Resonance. This resonance is what biology on Earth has evolved with, it is natures very own radio signal operating at a very low 7.83Hz (which is rising). This nature based ‘radio signal’ also correlates and resonates to our brain waves of Alpha/Theta. When we are surrounded by the scattered fields produced by man-made wireless devices, the Schumann Resonance is much harder to detect by the body resulting in miscommunications between cells and your local environment, often emotional agitation sets in. This natural 7.83+Hz signal is produced from the field given off by lightning interacting within the Earth’s surface and the Ionosphere, producing a very low hum to which we are tuned. Thankfully the technology in EMF Shield enhances the ability for your body to continue to tune into nature due to the way the codes in EMF Shield influence EMF from mobile phones, WiFi and other wireless communications to override their scattered disturbance into a field that is coherent and in alignment with nature, allowing natures signals to continue being received by the DNA and your internal organic cellular network. Sacred geometry is an ancient science, a sacred language, and a key to understanding the way the Universe is designed. 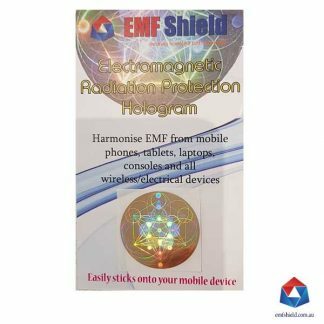 EMF Shield contains information infused with Organic Creation Codes to project a coherent field making incoming electromagnetic radiation from mobile (cell) phones, tablets, laptops, cell towers, WiFi, cordless DECT phones and other wireless devices, coherent and non-intrusive, therefore minimizing the negative impacts to your health. 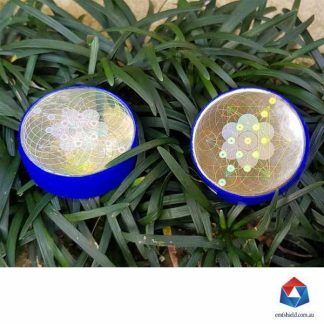 EMF Shield Unity Technology comes in a variety of versions to meet all your electromagnetic radiation protection needs such as holograms that easily attach to mobile devices and pendants offering personal protection wherever you go.